Cook: Lunch Bunch Chicken Chili | CookDrinkFeast! 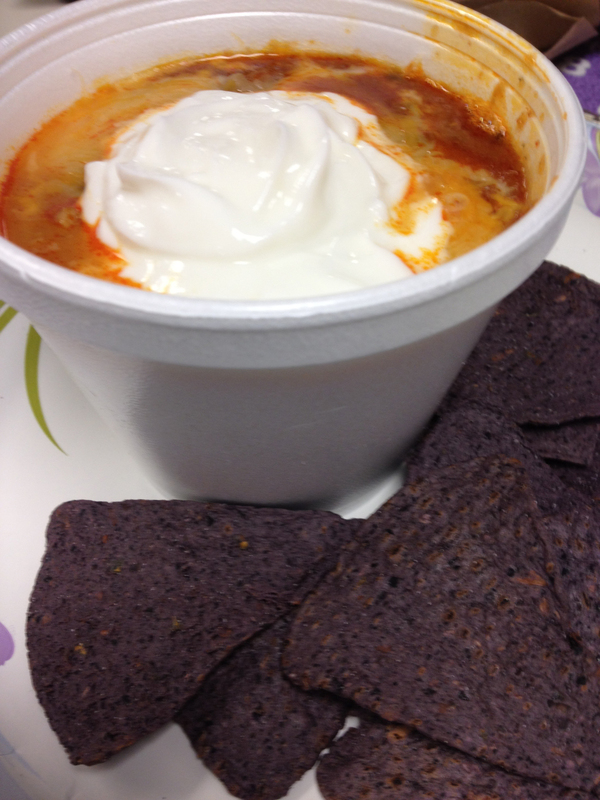 This week I brought in chicken chili for the lunch bunch. I’ve been working on my chicken chili recipe for quite some time. The lunch bunch assured me that I had perfected it. I’m a late-bloomer to the chili cookery realm. I hated chili as a kid. Specifically, I hated beans. But recently I found out that real Texas-style chili does not contain beans at all. In fact beans are an anathema to chili connoisseurs. My chicken chili is based on Alton Brown’s Pressure Cooker Chili Recipe. I adapted the recipe to be cooked on a stovetop. The tortilla chips act as a thickener, so be sure to crush them finely. Remember that tortilla chips are usually salted, so take care not to put too much salt in your chili. I use baked tortilla chips to save fat and calories. I serve my chili with toppings such as shredded cheese, fat-free Greek yogurt (a great substitute for sour cream), and diced avocado. Mix all of the ingredients except for the chicken, olive oil, and beer in a bowl. Set aside. Remove the remaining bits of skin and fat from the boneless-skinless thighs, then dice them into bite-sized pieces. Heat the olive oil in a large pot. When the oil starts to shimmer, sauté the diced chicken thighs until slightly browned and partially cooked through. Sprinkle with the salt. Add the beer, scraping the browned bits from the bottom. Add the salsa mixture to the pot, and stir to combine thoroughly. Turn the heat down to low, and simmer 30-45 minutes or until chicken is cooked through. Taste and adjust seasonings. Serve and enjoy!